Just a short longer note on something I would actually like to expand into a post for Afrigadget: mobile phone repairs. Back in 1998 when I first started fixing my mobile phone, things were a bit simpler. Fast forward in 2008, mobile phones have become a commodity and there are at least two or three guys in most rural towns (in Kenya and elsewhere) that will know how to fix such a phone. So why blog on it? – Because it’s the way ppl are looking for alternative solutions on how to fix an advanced mobile phone based on SMD technology that makes the story interesting. In a world that has become more and more modular, where spare parts are exchangable or product life cycles reduced to a lifetime of about 2-3 years (best example: printers), not all is waste or wasted, and many things may often be repaired with simple and sometimes even very rough methods. Ask any mobile phone repair shop @ Moi Avenue Nairobi and they will tell you how they managed to save this or that phone. This, to me, is especially interesting, as they are using similar tools like other jua kali fundis in Europe – in a different environment. Whereas phones in Europe are often owned and used by one person only, phones in dev. countries are often shared between family members or friends. No wonder Nokia came up with two new phone models for emerging markets the other day, offering more than one phonebook / user profile on a single phone. Hence the need for a different approach to service repairs…or not? What you see above in the pic – and I desp. 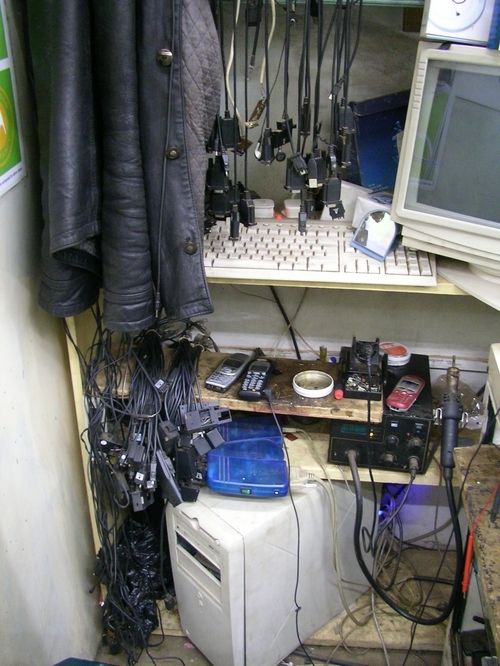 tried to get a decent pic of such a booth back in May 2006 when I last tried to cover this subject – are normal flasher cables. Serial & parallel cables, like datacables, ppl use to connect a phone to a computer to unlock a handset, flash the firmware or run some tests. Your handset is blocked by the network? Don’t worry, just reprogramme it (illegally) with a new serial number (~ IMEI). These are things done everywhere in the world – in the Middle East, in Asia, in Europe, Africa, etc. – only: they are all based on reverse engineering. Coming back to the initial question – why is it so interesting? Well, because manufacturers like Nokia or SonyEricsson create service manuals for their phones (which are then circulated over the internet), giving the schematics and parameters of each and every part. But they usually don’t train those jua kali fundis. And a licenced Nokia Service Center? Apparently, they often do apply the same techniques and may or may not be equipped with special and better service gadgets. And they are expensive. In other words: it’s cheaper and much more interesting for manufacturers to produce new phones than to train service staff on how to fix a mobile phone. Simple, new or refurbished phones are sold for something like 20,- EUR. And yet there’s this huge demand for quick & cheap repairs all over the world. This also applies to other electronics, cars or even lighters. Now, while reverse engineered / alternative / jua kali (phone) repairs are interesting and will most def. make a good story on Afrigadget, I am constantly asking myself how manufacturers like Nokia will profit from this niche and use such knowledge for further engineering? Yeah, well, maybe Jan Chipchase‘s research may be part of that, but then: who will fill this gap between new products and broken gadgets (leave this market to jua kali fundis and private individuals only?) and will a break-even point be the only criterion to define this approach on when it makes sense to invest in new equipment? What about environmental damage (during production) and how is this accounted for? The fast growing mobile phone sector is an interesting example to see how the world has changed, and I am currious to see when the majority of customers in places like Nairobi will prefer buying another phone instead of having the old one repaired. we were talking abt this with Erik! tutaongea…. In Kenya, the growth of the mobile sector is astounding, who thought the rural native earning less than a dollar a day would afford such a service. But as we all know now, most business corporations and entrepreneurs who shunned this forks are deeply regretting such a move even as safaricom makes a killing and laughs all the way to the bank. With good organization, learning and a bit of capital investment, there is a lot of money to be made by providing phone repair services to the forks who need such a service. Eventually all the service providers in Kenya and Africa in general will face the same problems providers in other continents face, i.e make money on phone sales or make money in selling the service itself. The market will soon be saturated with all types of phones, hence the only way for the providers to make money is entice you with a free new phone and lock you in in some type of annual contract which will unfortunately eliminate the need to fix or repair an old phone.